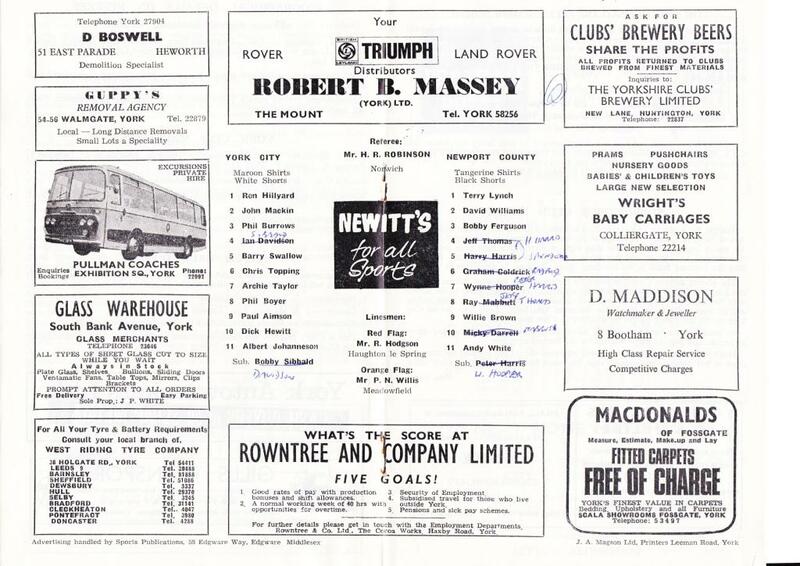 Memories from Alan Almond of City's 1970 encounter with Newport. Happy days. What a solid team that was (ably managed by canny old Tom Johnston). Not a weak link and Kevin McMahon was waiting in the reserves to take over from Phil Boyer when the latter made his £20,000 transfer to Bournemouth in December. My all time favourite City defender Phil Burrows was in his prime. What a classy left back. At the time City were 9th from bottom but the 1-0 win against Newport County helped turn things around. We finished the season with an excellent promotion run which resulted in us going up in 4th place (along with Notts County, Bournemouth & Oldham). All good fun especially as I had started watching City when we were in the middle of a run of being in the bottom four (and having to apply for re-election). For further details get in touch with Rowntree & Co at the Cocoa Works"
A little bit of social history!! It reminds me that we have had some tough times in the past but I have had some great fun following City over the years. Let’s get behind the current team. We have a great bunch of lads and the directors / coaching staff have really done a smashing job in the last couple of years. The staff in the office / shop are always very helpful. As a season ticket holder I ordered my FA Cup ticket for the Stoke match by phone at 3pm and by 10am the next day it had arrived at home in North London. Well done. Don’t forget the youth side, they are having a great season and the parents / youth supporters have been brilliant. We will no doubt have a few dodgy moments before the season ends but let’s get behind the lads. It can be frustrating sitting in the Main Stand at York when some of the home regulars show their displeasure if we aren’t 3-0 up after 20 minutes. The support from City fans at away matches is more positive and constructive (apart from the odd idiot). It has been a good year to see the team develop and on my travels (to York, Oxford, Hayes, Gateshead, Luton, Wimbledon, Cambridge, Grays !! & Stoke) I have been impressed by City’s professional and efficient approach. What ever the final outcome in 2009/10, we have already exceeded my expectations. Let’s have less moaning about "big match supporters", "Bootham Crescent or die", "dodgy travel planning", "past club management" etc. We have a great club with a proud history but we have to look ahead and be positive (and prudent). Here’s hoping that the weather eases off and allows the Hayes match to go ahead on Saturday. Again many thanks to the guys who are helping to clear the snow. If I wasn’t 150 miles away I would be there to help but your efforts are appreciated. I have my cheap but non-refundable rail ticket so fingers crossed that we have a game. Keep the faith everyone. A final note of appreciation. JOSH, you are doing a great job by keeping all the news coming through on TOOAB. It is not unrealistic to say that City would probably have folded without your amazing efforts. Good on you mate. Have a great 2010, Josh. PS to Josh, don’t be surprised if you see a Daniel McBreen York City shirt being worn by an Aussie teenager in Stanthorpe (Queensland). I was a successful bidder for this item in the youth team fundraising shirt auction. A good mate from school days emigrated to Australia and the shirt was sent to his 15 year son as a Christmas present. Apparently the shirt was a big success and it hasn’t been taken off by Charlie since he got it.